Robert A. Brady provides further evidence of the capitalist nature of Nazism in his book, The Spirit and Structure of German Fascism (London: Victor Gollancz 1937) by pointing out how the Nazis promoted private industry and businessmen as part of the biological elite, who were entitled to positions of leadership. They also embarked on a campaign of privatization of state enterprises, and promoted to positions of leadership in the economic direction of the state private businessmen, even when the majority of enterprises in that particular sector of the economy were state owned. And finally, the German law the Nazis used to promote their management of industry was that which recognized the management of private property for public use, as against proper socialized or nationalized industry. Brady points out that the businessmen and functionaries who joined the Advisory Council of the National Economic Chamber had to take an oath to serve the Fuhrer and National Chancellor, which meant Hitler in the two offices he occupied, the goals of the National Socialist party, the Third Reich and the construction of the people’s community. (p. 265). But he also quotes Hitler’s economics minister, Hjalmar Schacht, who declared that businessmen were indispensable to the Nazi system, as was free competition. “We cannot dispense with the economic willing of individual business leaders and workers,” Schacht said. To do so, he held, would be to destroy “the creative power” of the people. The function of business enterprise is to release this creative power on behalf of the nation. “Under no circumstances,” he continued, “shall we destroy the multifarious individual character of our economic system. For all time to come we shall need the independent employer who, for better or worse,, is connected with his enterprise.” In other words, businessmen in the new Germany are to be given free rein to function as before, except now they must be “honest” in the sense that they must not resort to “unfair” tactics to achieve corporate ends. (pp. 265-6). He further quotes Schacht as saying, “We cannot get along without an honest struggle of competition”. (p. 266). Since the whole Nazi philosophy necessarily calls for this apotheosis of bourgeois and capitalistic virtues, it is only natural that when they were presented with an opportunity to shape organization more nearly after the pattern of their hearts’ desire the business men should also be able to name their controlling staff of “Leaders.” And such has been the case. In all the literature published by business organisations, and of all the dozens of businessmen personally interviewed in Germany, regardless of their industrial, trade, or financial origin, not a single criticism has been found of the type of “Leaders” placed in command. There is a great deal of complaint about individuals and policies, but there are uniformly the pleadings of minority groups who are being discriminated against, or else against the specific incidence of policies which economic facts compel them to endorse. Further, the leadership has been entirely that of men enjoying the confidence of the business community. This holds for the Chambers of Industry and Commerce, the Provincial Economic Chambers, the various National, Economic, and Functional (or Trade) Groups, and the National Economic Chamber and its various subdivisions. The first Leader, Schmitt, was a well-known German business man, and thoroughly acceptable to the business community at large. The second Leader, Dr. Schacht, has been so completely acceptable, and his dicta so readily enforced throughout the country, that he is commonly known as the “economic dictator of Germany.” Under the leadership of these men, the appointment and removal of inferior “leaders” through the system has been, with minor exceptions, entirely to the satisfaction of the business communities affected. (p. 290). He also describes how private industry, and privatization, were promoted against state industries. The same picture holds for the relations between the National Economic Chamber and the organs of local government. As Frielinghaus has put it, “The new structure of economics recognizes no differences between public and private economic activity…” Not only are representatives of the various local governments to be found on both the national and regional organs of the National Economic Chamber, but it is even true that local government is co-ordinated to the end that economic activities pursued by them shall enjoy no non-economic advantages over private enterprise. The literature on this point is perfectly explicit, being of a nature with which the general American public is familiar through numerous utterance of business leaders on the “dangers of government competition with private enterprise.” Under pressure of this sort the Reich government and many of its subsidiary bodies have begun to dispose of their properties to private enterprise, or to cease “competition” with private enterprise where no properties are at stake. Thus the Reich, the states, and the communes have already disposed of much of their holdings in the iron and steel industry notably the United Steel Works), coal, and electric power. Similarly, support is being withdrawn for loans to individuals wishing to construct private dwellings wherever private enterprise can possibly make any money out of the transactions. True, the government has been expanding its activities in some directions, but mainly where there is no talk of “competition with private enterprise,” and with an eye to providing business men with effective guarantees against losses. (pp. 191-2). A little while ago I posted up a piece from Maoist Rebel News on YouTube, which also cited articles from economic history journals to show that both the Nazi and Italian Fascist regimes engaged in massive privatization programmes beyond those of other industrialised western nations at the time. Brady also points that, while three quarters of the German electrical industry was state-owned, it was private businessmen who were placed in charge of it. Nothing could show more clearly the intent of Nazi control in economic affairs than the make-up of the active management of this organization. Despite the fact that better than three-fourths of all German electric power is owned or controlled by public bodies, the directing heads of the National Electric Power Supply Federation are drawn almost exclusively from the ranks of private enterprise. Its first Board of Directors was presided over by two chairmen, both representative of private power companies: Hellmuth Otte, General Director of the Hamburg Electric Works, Inc. (controlled by the Siemens-Schuckjert combine, largest manufacturers of electric equipment and supplies in Germany), and Dr. Wilhelm Luhr, member of the Board of Directors of the Gesellschaft fur Elektrische Unternehmungen-Ludwig Lowe & Co. A.G. (the largest holding company in the private German electric-power industry, the company likewise controls several electrical supply manufacturing concerns). This is very similar to the corporatist system in Britain and America, in which businesspeople have been appointed to government posts overseeing the economy. This has been done both by the Republicans and Democrats in America, and by the Tories and Blair’s New Labour over here. George Monbiot described the situation in Britain very thoroughly in his book, Captive State. He also makes it very clear that Nazi economic planning is based very much on private enterprise, going back to a distinction made between private property for public use and socialized property in German law. This interpretation is in line with an old distinction, running back through several generations of German economic and business literature, between privatwirtschaft and Gemeinwirtschaft, on the one hand, and Gemeinwirtschaft and Sozialwirtschaft on the other. Privatwirtschaft has always been taken to mean an economy of private enterprise in the English, liberal, laissez-faire sense. Gemeinwirtschaft was used to mean a profits economy from the public point of view, or, in other words, a profit economy supplying a service tot he community. Sozialwirtschaft, on the contrary, has long meant socialization. All the Nazi literature emphasizes the present economic system as a Gemeinwirtschaft. (pp. 319-20). It is thus very clear that the Nazi economy was very definitely capitalist. It celebrated the private businessman as a member of the economic and social elite, and promoted private enterprise and its leaders against state-owned industry, which it also privatized as far as possible. And it made very clear in law that the economy was a private enterprise supplying a public service and not a socialized economy. Those who claim that Nazism was a form of socialism are wrong, and arguing so in order to try to discredit socialism and the Left through guilt by association. But the Nazis promotion of private enterprise, business interests and management also make it extremely similar to contemporary corporate capitalism, as advocated by the Republicans, Corporate Democrats, Tories and Blairite New Labour. It seems employers will seize any opportunity or technological development to spy on their workers. Yesterday the I carried a story about a tech company, that had developed a chip, carried in a security card, that would allow employers to monitor the whereabouts of their workers as moved through their building. It would help them see if they were spending too long in the loos or otherwise wasting time. This is very much like something out of some of the nightmarish futures portrayed in cyberpunk SF. In Jack Womack’s novels of a parallel Earth in which central authority has collapsed along with Christianity – Ambient, Heathern, Random Acts of Mindless Violence and Elvissey – power is held by an oppressive industrial conglomerate. This corporation makes sure its staff stays at their desks through the simple expedient of shackling them there in stocks. And we’re getting closer to that nightmare future all the time. I’ve mentioned the book on the terrible way office workers are treated in America, White Collar Sweatshop, before on this blog. One of the elements of modern American office life that was draining any kind of joy from clerical work was the constant surveillance. And it’s being done over here to call centre workers. According to Private Eye, the weirdo Barclay Twins also tried to inflict it on their hacks in the Torygraph. The Gruesome Twosome had motion detectors put up around the hacks’ desks, so they could tell when they were walking about and not sat behind them making up stories about how wonderful capitalism and the Tories were, and how Corbyn was an evil Communist anti-Semite. This was a step too far for the galley slaves on the sinking rag. They revolted, and the vile pair had to take them down. Britain really is becoming a totalitarian, Orwellian society, where we are monitored all the time. In 1984, the TVs watch you, to make sure you’re doing what Big Brother’s government wants. Now there are fears that private companies are collecting personal data on individuals from the internet, in order to target them better for advertising. And this is apart from the expansion of state surveillance under the Snooper’s Charter, and the travesty of the Secret Courts, in which you may not know what you’re accused of, nor the evidence against you, or who the witnesses and accusers are, or have members of the press and the public present, if the authorities deem all this is endangers ‘national security’. And with the corporate media now panicking that no-one’s watching the Beeb and other news broadcasters because of their horrendous pro-Tory bias, perhaps it won’t be too long before some bright spark at a right-wing, corporate thinktank decides that we really ought to be monitored to make sure we’re watching the required amount of TV per day. Just like in the Robert Rankin comic SF/Fantasy novel, Armageddon – The Musical. As for how evil the corporate masters of Womack’s fictional world is, the Southern businessman whose drawling pronunciation of ‘Heathen’ provides the title of the second book in the sequence, Heathern, organises shooting parties where the quarry is Black, Asian and Mexican children. So far our captain of industry aren’t that despicable. Not just yet. On the other had, we do have IDS and Esther McVile to thank for the genocide of the disabled. This is their warped welfare policy, in which the goal is to throw as many desperate and needy people of government support as possible, even if it kills them. According to an official report, this has resulted in the deaths of 120,000 people. They’re killing people, but doing so without alarming the sensitivities of all the ‘aspirant’ middle class folks, who vote for them. No gas chambers or SS-style murder clinics, as under Aktion T4. They just through them off benefit, have the Heil and the rest of the baying Tory press vilify them as frauds and scroungers, and leave them to starve to death. But we can put actually physically shooting the poor for sport past them? Toby Young is an ardent supporter of eugenics with a hatred of the working class and nothing but sneers and contempt for ‘diversity’ and feminism. He also wrote that he masturbates to images of starving Africans. And his oppo Ben Bradley wanted the cops to play ‘splat the chav’ during the 2012 London riots. It might be a bit of stretch, but I can imagine both these charmers writing stupid pieces about how shooting chavs and the rest of the disadvantaged would be a nice day’s sport. No, not Marillion, who had a hit in the 1980s with the classic, ‘Kayleigh’, and whose singer was called Fish, ’cause he drank like one, but Carillion, the outsourcing giant which has gone belly-up. Mike’s put up a post about Carillion’s collapse, pointing out that the company was in dire financial trouble, and had issued at least three profit warnings. But miraculously it was still able to win government contracts. George Osborne, our former comedy Chancellor to Dave Cameron’s comedy Prime Minister, decided to put his oar in today. Faced with the question of who was responsible for awarding these contracts to the ailing company, Osborne did what every Tory does: he lied and spun. Oh no, whined Osborne, now the editor of the Evening Standard, it’s not the Tories’ responsibility they got government contracts. It’s all the fault of civil servants. Er, no, George. It’s not. It’s your fault, and the fault of every Thatcherite government since the days of John Major. If you enter the civil service, you will be told that it is your duty to provide the government with impartial advice. This marks the British civil service out from its continental cousins, where the upper levels of the civil service belong to the ruling party, and so change with each election. There have been cases when the civil service has been less than impartial, such as when the rail network was privatised. This was the brainchild of a particular civil servant, who was a keen promoter of free market private enterprise. But this particular mandarin has been and gone. Looking back, a scandal like Carillion was almost inevitable. When outsourcing began in the 1990s under John Major, firms like Capita, dubbed ‘Crapita’ by Private Eye, became notorious for the way they continually got government contracts, despite coming in late and over budget on just about all those they had been awarded. Or else the systems they installed just didn’t work. But it was Tory – and Blairite – ideology that private enterprise was always better than the state, even when, to most people, it most certainly wasn’t. And there was a revolving door between these firms and the Tory party. Under John Major, the various ministers responsible for privatising particular firms magically got jobs on the board of the same, now private companies, afterwards. Amazing! But civil servants weren’t to blame for that, although certain high level civil servants did benefit from the revolving door, particularly and most notoriously in the MOD. The system got so bad that John Major’s government got a justifiable reputation for ‘sleaze’. But a French politician was much more accurate in his description of it. He said that in Britain, we called it ‘sleaze’, but in La Patrie, they simply called it ‘corruption’. Indeed. Over the other side of La Manche, a civil servant or politician has to wait two years after they’ve retired from office before they can take up a job with a private firm. Which means that their address book, which is what the firm really wants, is out of date, and they’re of no value to them. Problem solved. Carillion was allowed to go on because of a series of legislation put in place by the Tories to protect the outsourcing companies. Like as private companies, they are not subject to FOIA, and any attempts to probe their financial affairs is automatically denied by the government on the grounds of ‘corporate confidentiality’. You see, such requests would jeopardise their position by opening them up to scrutiny by their rivals. We’ve seen this used when justifying giving contracts to private firms in the NHS. NHS performance is published and scrutinised, but not those of the private firms angling for lucrative NHS contracts. This has been brought in by the Tories, including Dave Cameron and George Osborne. And while we’re at it, let’s make the point that much government advice doesn’t come from the civil service. It came from private consultants, like Anderson Consulting, who were responsible for turning the Benefits Agency as was into the shambles it now is. Under Tony Blair this grew to enormous proportions, so that Blair was taking advice from SPADs -Special Advisors – from private industry, rather than the civil service. So it’s fair to ask which set of private consultants argued that Carillion ought to be given a contract? Perhaps no-one did, but I think it’s a fair question, given just how much sponsorship the Tories received from private industry. Was Carillion one of their corporate donors? So who’s responsible for the government awards given to Carillion? You are, George. You, Cameron, and your whole disgusting party. Now stop lying. You were rubbish as chancellor, and you’ve got no business editing a paper either. I found this nasty, grim piece from the Telegraph quoted in ‘The Opinion Matrix’ section of today’s I, where the newspaper reprints extracts from the rest of the press. It shows the Torygraph’s hatred of the NHS, and its determination to push for its privatisation. Regarding the National Health Service, we have become like an abused partner who cannot tear themselves away as a nation, we know something is wrong but we can’t admit the truth. Such is our love affair with this failing institution that even the smallest of reforms are shouted down. Politically it’s virtually impossible to propose the funding shake-up required. A Royal Commission has been suggested but you’ll never get cross-party support for meaningful reform, for the left, the NHS is too useful a weapon. And so we beat on, until eventually the system breaks, or indeed as would occur under Labour, the system breaks the economy itself. This was written by Jeremy Warner, and the piece comes under the headline A Tax on Healthcare. It’s on page 18 of the I, for Saturday, 13th January 2018. In fact, the NHS is by far the most efficient, cost effective healthcare system than the American system of private healthcare. The Americans spend massively more on their healthcare service, which certainly doesn’t cover everyone in America. According to Bernie Sanders, 40,000 people die every year because they can’t get medical care. And until the Tories took over, it compared very favourably with the other healthcare systems in the rest of the Europe, which receive considerably more funding. Way back in the 1979, a committee of inquiry concluded that there wasn’t any problems funding the NHS. They expected funding to increase naturally to cover expenditure. As for the comments about the ‘last Labour government’, the knee-jerk response of Tories with no other form of defence and nothing else to say, under Labour the NHS was in budget. I’m not a supporter of New Labour and its healthcare reforms, because Blair really did want to privatise the NHS by opening it up to private industry, just like every Thatcherite politico before him. But he did keep it in budget, which is far more than can be said for the Tories, and specifically Andrew Lansley and Jeremy Hunt. If the NHS is failing now, it’s because it’s being deliberately run down by the Tories, who desperately want to introduce a system of private health insurance like America. This won’t make healthcare more efficient. By contrast, private healthcare is far less efficient than state medicine in dealing with illness. Private health companies do not like dealing with the disabled and long-term sick, and so the people, who find it easiest to get health insurance are the well. In other words, those who need it least. Private hospitals are smaller than state-run hospitals, and vastly more inefficient due to the costs of management, advertising, legal departments and so on. All of which can be a real surprise to Tory drones, used to believing all the crap that private enterprise is more efficient than state industry. The Tories have no interest in improving state healthcare, despite the specious lies Jeremy Hunt has said about how they ‘treasure’ it. They want to privatise it for the corporate profit of their friends in big business. And this clearly includes grasping newspaper magnates like the Torygraph’s owners, the weirdo Barclay Twins. This little piece shows the determination of the Tory party to privatise the NHS, and the lies they’re using to justify it, all while Hunt and May deny that they are doing any such thing. This piece of news was reported in the Bristol Post yesterday. Care UK, the private healthcare provider, which runs some services on behalf of the NHS in Emerson’s Green in Bristol, was sending out material to GPs, including price lists of operations up to £9,000. The company was hoping to encourage them to get people to go private for a number of simple operations, so that they could jump NHS waiting lists. The paper noted that there was a long waiting time at Emerson’s Green for operations. This naturally outraged GPs and organisations dedicated to preserving our embattled NHS, and much of the article was comments from them attacking this latest attempt by private enterprise to run down the Health Service. Those defending the NHS and protesting against Care UK’s actions made the point that this was very much part of the general ‘direction of travel’ that the government has been following in its policy of privatising the NHS. Mike put up an article a few days ago reporting on the latest Tory wheeze to privatise GP services, using much the same trick. This involves a special line you can use, where, for £40, you can jump the queue to be seen by a GP. Mike stated, very clearly and entirely accurately, that this was against the principles of the NHS, and was about setting up a two-tier health service. Of course it is. All these private services violate the founding principles of the NHS that healthcare should be universal and free at the point of service. Maggie Thatcher wanted to privatise the NHS completely, but was prevented by a cabinet rebellion. She did, however, have the goal of making 25 per cent of the British population take out private health insurance. Peter Lilley and John Major introduced the Private Finance Initiative, because they wanted to open up the NHS to private investment. Meaning they wanted private enterprise to run hospitals, clinics and so on. As did Tony Blair and New Labour – the right-wingers in the Labour party, who are now telling you that Jeremy Corbyn is too left-wing and unelectable. And David Cameron and Theresa May have been just as determined to privatise the NHS. Under the terms of Andrew Lansley’s 2012 healthcare act, the secretary of state for health is no longer responsible for making sure that everyone has access to state healthcare. And the Tories have deliberately arranged the reforms to allow healthcare providers to charge for services. Again, this is a violation of the fundamental principles of the NHS. Enough’s enough. It’s time the Tories were thrown out of government, and parasites and profiteers like Care UK out of the NHS. Jeremy Corbyn has promised to renationalise the NHS. If there was only one reason why Britain needs him and Labour in government, this is it. It is usually assumed that in a capitalist economy the Trade Union movement fulfills a different and essentially more democratic role than the unions in a country such as Yugoslavia. It is said that by remaining independent of management and government the unions provide the essential element in any democracy, that of opposition. This has always been one of the stumbling blocks which any advocate of workers’ control must encounter. An understanding of the role of our own trade union movement is a necessary first step towards working out a programme for democratising industry which does not fall foul of this traditional objection. This understanding may be furthered by an appreciation of the position of trade unions in other countries where social systems are different. In Britain it may well be that the trade unions become more and more committed to the status quo in industry, so their opposition function is weakened. The respect for national collective agreements, the support of the leadership for the current productivity drive, the discouragement of unofficial strike action, the rejection of co-ordinated industrial action to break the pay pause, and finally the decision to join the NEDC suggest that the unions are moving towards the position of partners in a managerial society. The simple distinction between free trade unionism in a capitalist society, and trade unions in a communist state which become organs for the implementation of state policy, becomes increasingly blurred. We should think instead of a spectrum of relative degrees of independence from the state, ranging from the Russian trade unions at one extreme, through Yugoslav, Scandinavian and Dutch, to the British and American movements at the other, with perhaps the Communist Unions of France and Italy as the least committed to the state. The recognition of this trend does not imply advocacy of a general strike mentality over the pay pause, for example, but we need a more honest recognition of what is taking place. We should admit first that it is inevitable that the trade unions will move in the direction of close co-operation with government, and towards a ‘national interest’ point of view. As this trend continues, the worker is faced with the growing prospect of an alliance between government, employers and unions. In this situation union leaders no longer express the independent sectional and industrial aspirations of their members. Partly because of this, the role of the voluntary rank and file element in trade union government appears to be diminishing and its functions are being superseded by paid officials. The unions are becoming agencies run for their members and not by them. With the weakening of the elements of opposition and participation there is a need to seek alternative means by which employees can express themselves in the government of industry. This need arises not only from a consideration of industrial democracy, but also of industrial efficiency. Appeals for increased industrial production, such as British Productivity Year, evoke slight response because they are based on an assumption of team spirit and equal partnership which is excluded by the very nature of social relationships in a private enterprise economy. Yugoslav experience strongly suggests that increased productivity is one of the results of their form of industrial democracy. However if democratisation in industry is advocated solely on grounds of higher productivity, it will be received with suspicion. The question would not be how much power and control can we give to democratic forms of management, but rather how small a concession will be necessary in the interests of productivity. Such a path would reproduce the history of progressive disillusion which has befallen Joint Consultation. Thus the idealist exponent of workers’ control may claim to solve must fully the economic problem of incentive. In Britain, advocates of workers’ control have traditionally thought in terms of Trade Union management of industry. Efforts in this direction have always ended in a blind alley, since the objection that this involves a dual loyalty for the union is a valid one. As we have seen, the Yugoslav system does not involve Trade Unions in the direct management of the Enterprise. It suggests not only a new role for the Unions, but also the practical constitutional forms for the management of the firm by its employees. The role of the unions in such a system is that of a mass social institution representing the wider national interests of the workers and tackling problems such as the overall levels of incomes and income structure, labour productivity etc. As we have suggested, there is already a tendency for British unions to assume such a role, and the doubts which we have raised about the desirability of this trend would be dispelled if the unions were operating within the framework of an industrial democracy. If workers had legally guaranteed rights of management then the need for the union to be an instrument of opposition is weakened. However, unions could still continue to protect the interests of their members by taking up grievances on behalf of groups and individuals who are in dispute with the elected management bodies. They should certainly seek to influence the decisions and activities of management bodies, but should not be tied to them in an institutional sense. In considering the relevance of the Yugoslav model to British conditions, two objections may arise. The First concerns the compatibility of Industrial democracy and the private ownership of industry. Does it not challenge the very origins of power which are possessed by the managers of private enterprise firms? Is it not desirable for the Labour movement to give much closer attention to the possibility of introducing experimental forms of workers’ control within existing nationalised industry. This would demonstrate the practicability of the method and point a way to the fully democratic society at which the socialist movement aims. The second objection is more difficult to counter. Yugoslavia is a one party state. is it likely that in a multi-party state, industrial democracy could be introduced with any guarantee of its permanence? Would not the anti-socialist forces exert such pressure that the system was undermined whilst it was being introduced, and abolished at the first opportunity presented by the return of a Conservative government? It is probably true in Yugoslavia that the permission of opposition views and organisations could generate counter-revolutionary forces which would seriously retard the evolution of the system. The government and the Party clearly fear this. Thus after flirting with Djilas’ heresies, which included the advocacy of a second – though socialist – party, the leadership decided against taking the risk. This is the point at which Yugoslav experience ceases to be helpful to us. We should not therefore assume that the introduction of industrial democracy in the British context is impracticable. There are signs that unease concerning status at work has penetrated through to the political arena. Liberal party references to ‘syndicalism’ and the long-awaited Conservative Industrial Charter are manifestations of this. These schemes relate to the improvement of the position of workers within the present hierarchical framework, and do not tackle the root of the problem. We would expect that the early demonstration of the viability of a system of democratic control within the nationalised industries would generate enthusiasm for the idea and lead to demands for its extension. The British political system certainly restricts the speed of change, but a change which has become truly popular is difficult to reverse (e.g. The National Health Service). We believe that the Labour Party could, by taking the first steps towards democracy within nationalised industry, transform what has been an electoral embarrassment and a millstone into its biggest asset. See Part 3 for my own conclusions. Mr. Mason goes on to state that in private, Hammond’s language is even more extreme, presenting Labour under Jeremy Corbyn as a threat to capitalism. As Mike points out, it isn’t. It’s a Social Democratic party. This means it promotes a mixed economy along with a welfare state and government spending in the economy as a means of stimulating economic growth and development. It has not advocated total nationalization since the Second World War. And in the governments it formed before then, in practice its economic policies were entirely orthodox. This undoubtedly contributed to the party’s defeat as voters were disappointed by its failure to pursue a more radical programme to tackle poverty and unemployment. Mason makes the point that Hammond risks being sacked for ‘unparliamentary conduct’, as his speech has urged captains of industry to break their bond of fiduciary trust. This is notion that they will act for the benefit of their companies and shareholders, regardless of their own personal politics. Mike makes the point that it’s moot whether the issue of fiduciary trust has ever carried much weight amongst business management. Certainly sections of industry, particularly the financial sector, have been hostile to Labour and sought to undermine Labour governments. Mr. Mason and Mike also point out that historically the economy has always benefited under Labour. Mason states that Labour will stabilize and re-invigorate the private sector. And Mike says, quite rightly, that the Labour government of 1945-51 led to over three decades of economic growth and prosperity in the UK. A period that only came to an end when Thatcher became PM in 1979. And Mason also warns that Hammond may have made even more extreme claims in private to MI5. You therefore start to wonder if Hammond is a serious, democratic politician, or a barking mad Fascist sympathizer, who’s read too much Ayn Rand. He clearly thinks of himself as John Galt, the hero of her novel, Atlas Shrugs, who joins a strike by senior management to bring down a despotic socialist government. By implication, this also shows Hammond’s complete support for the poor and those on welfare. For Ayn Rand, only business leaders, artists and intellectuals matters. Ordinary working people, including and especially those supported by welfare, were just ‘moochers’ and ‘takers’. Which is ironic, because Rand was one of them. She spent some time living on social security. As for Hammon, he has the same attitude as the industrialists and upper classes of the various South American and other developing nations, who as soon as a vaguely left-wing government came to power immediately yelled ‘Communism!’ as fast and as hard as they could, and then started plotting how they could overthrow it. This included backing military coups, supported by the Americans. And you can guess the kind of extremism he may have been preaching to MI5 and the security services by reading Ken Livingstone’s book, Livingstone’s Labour, and Francis Wheen’s book on the 1970s, Strange Days. During the crisis hit period of the Labour minority government of 1975-6, various businessmen, and even the Times, were urging the army to organize a coup to overthrow the government. Livingstone describes how there were plans in place to intern left-wing activists, including journos, in political camps in places like the Hebrides. It also shows the Tories’ own immense hypocrisy. They and their lickspittles in the press have been the first to denounce working class unrest as a threat to democracy, including strike action by trade unionists. You can find a video on YouTube by one person, who clearly takes John McDonnell’s demand for coordinated strike action and protests as a literal threat to democracy. McDonnell states that this type of activism has previously been called ‘insurrection’, a term he prefers. Which for that YouTuber makes McDonnell and Corbyn members of the revolutionary left. McDonnell’s language is extreme, but it isn’t quite the language of revolution. He has not called for people to take up arms against their government. And when you think how this government is treating the poor, the unemployed and the ordinary working people of this country, you can see McDonnell’s point, even if you don’t agree with it. And right-wing organisations have done their best to stamp out trade unions and bar the members from proper employment as true subversives. Way back in the 1990s there was a documentary uncovering the sordid history and activities of the Economic League. This was an organization that compiled and circulated blacklists of trade union members and those of left-wing organisations to employers. It’s full name was the ‘Economic League against Industrial Subversion’. It was started in the 1930s or so. It suffered a crisis after it was exposed, and found itself fending off awkward questions by people asking if they were on its lists after they were repeatedly turned down for work. In the 1990s it was succeeded by another bunch, Hakluyt, who, along with their predecessor, appeared in Lobster. This shows very clearly the hypocrisy of the Tories and the businessmen, who support them. When it’s the left and trade unionists planning strikes and protests against them, it’s a horrendous plot to overthrow capitalism and little short of treason. But it’s fine and dandy when they’re planning to subvert democracy by overthrowing an elected social democratic government. Hammond’s a danger to democracy. His ideal would be for Britain to be a banana republic, in which the peons have no rights, and the government is either dominated by a single party, or at best the political system as a number, none of which represents real hope or radical change for its working people. He should not be in government. Get him out. Mike yesterday put up a very necessary piece critically examining the Tories’ claims that Britain now has ‘full employment’, meaning that the unemployment rate is 4.5 per cent, and three million more people are in work since this time last year. Mike states very clearly that if you’re confused by your inability to get a decent job or a proper, living wage, despite this news, you’re quite right. It’s because the figures are a lie. He cites the figures included in two critical reports of the Tory claims, one by The Canary and the other by the UK Business Insider. The Canary states that in order to reach this figure of 3 million more in work, the Tories have had to include 10,000 unpaid family workers and 35,000 on temporary training contracts. As for wages, these have fallen by 0.5 per cent year on year, so that you’re actually £6 worse off now than when the Tories took power. And the UK Business Insider states that the official stats are lies, and the true unemployment rate is higher. Much higher. So high, it will shock you. “The statistical definition of ‘unemployment’ relies on a fiction that economists tell themselves about the nature of work,” the article states. “The official definition of unemployment disguises the true rate. In reality, about 21.5% of all working-age people (defined as ages 16 to 64) are without jobs, or 8.83 million people, according to the Office for National Statistics. They also state that this is proved by the fact that wages have not risen. Economics states that if there is low unemployment, then wages should rise as firms compete to attract more workers by offering higher wages, because labour is so scarce. But instead, public sector wages are capped at 1 per cent, and wages generally are stagnant. “More important, wages are not keeping pace with inflation… Workers’ real incomes are actually in decline, which is weird because so-called full employment ought to be spurring wages upward. Overall inflation ought to be driven by wage inflation. Yet wage inflation isn’t happening. Now, you could argue that nobody is saying that 21.5 per cent of working-age people aren’t out of work – the employment rate is only said to be 75 per cent, after all. But the unemployment rate is said to be only 4.5 per cent. That’s why we’re being told the UK has full employment and it isn’t true. That’s why you can’t get a job that pays well – even though the Tories claim there are 768,000 vacancies; there are still so many people out of work that they can continue pushing wages down. This is important, as these fiddled and highly unreliable figures are being touted by the Tories to show that they’ve been successful in tackling unemployment. And as Mike’s shown, they’re a grotesque falsification. Mike’s piece has also confirmed what I’ve suspected for a very, very long time: that the official statistics for unemployment have been doctored and adjusted by successive governments to disguise the real rate, that they’re completely unreliable. I can remember how Margaret Thatcher’s administration altered the official unemployment rate when she came to power way back in 1979. And every government since then has done the same thing. The latest trick done by the Tories was by making the figures count only those who were signing on as jobseekers. As the whole benefits system is designed to humiliate benefit claimants into either getting a job, or not signing on, with sanctions imposed for even the most trivial reasons, many people don’t sign on for jobseeker’s allowance because of the stress of being harangued and bullied by the jobcentre staff. Thus the unemployment figures are a conscious lie here, based on a spurious method of counting the unemployed. Then there’s the actual percentage of people really unemployed in Britain – 21 per cent. This makes a complete lie out of the Tory claim that we’re much better than the other EU states, which may have an unemployment rate of 25 per cent. I’ve read that this is Spain’s unemployment rate, along with some of the other EU countries. The argument is that these nations’ more generous welfare systems and highly regulated economies are causing high unemployment by stifling the free market and the beneficial effects of private enterprise. This becomes extremely questionable if the true British unemployment rate is only 4 per cent behind that of states like Spain. Moreover, economists such as Ha-Joon Chang have shown that free market economics simply don’t work, and that the older, ‘Keynsian’ system of protectionism and a mixed economy with a welfare state actually works far better in promoting economic growth and prosperity. My guess is that the drive of successive European government to have 50 per cent of all school leavers enter higher education is also, in part, an attempt to disguise an otherwise high unemployment rate. There probably simply isn’t the jobs for all the school leavers, if only 2 to 20 per cent of young people entered university as they used to before the expansion of higher education back in the 1990s. In short, the unemployment figures May and her cronies are proudly boasting are complete fabrications, designed to deceive the public into believing the economy and job opportunities are far better than they are. Don’t be fooled. Get May out before she make the situation worse, and already desperately poor people even poorer. 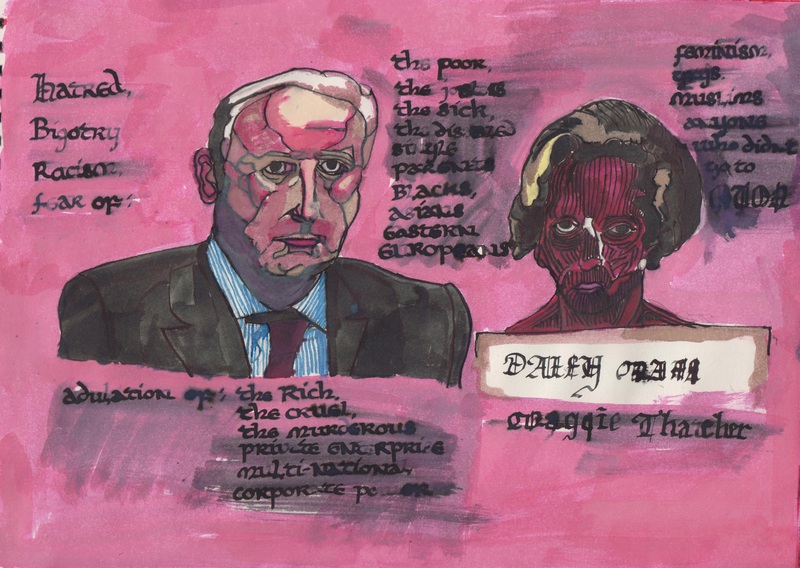 A few years ago I made a series of drawings, in which I attempted to give visual expression to everything I hated about the Tory party and the British press. One of these was a picture of the Daily Mail, symbolised by its editor, Paul Dacre, and Margaret Thatcher. I drew Thatcher as a flayed corpse, as despite the fact she’s been dead for about five years, and was forced out of office way back in 1990/1, she’s still been a powerful ghost haunting British politics. Anyone who didn’t go to Eton. Mike last week ran a couple of stories, which included amongst their other details the facts that Smudger and another Blairite, Neil Coyle, now seem to be trying to convince the public that rather than being neoliberal privatisers, they are really the spiritual heirs of Clement Atlee, Nye Bevan and ’45 Labour government that set up the welfare state and the NHS. Last Friday, 9th September 2016, Mike commented on an article from Left Foot Forward commenting on how Smudger had been booed by the Corbynistas after he yet again invoked the memory of Nye Bevan, the architect of the NHS. Left Foot Forward commented that both sides were invoking this iconic statesman, but that their attempts to hark back to him were problematic because of the contradictory nature of his ideas. Is it true that both sides of the current Labour debate will invoke the memory of Aneurin Bevan? I’ve only heard Owen Smith doing it – and inaccurately. It seems more likely that Mr Smith wants reflected glory – he says he’s a fan of Mr Bevan so he must be okay as well – than to actually call on any of the late Mr Bevan’s political thought, which would be so far removed from the policies of Mr Smith’s strain of Labour that it would seem alien. You don’t see Mr Corbyn invoking Bevan at the drop of a pin, do you? Then Neil Coyle, one of the Blairites, started to bluster about how he was also a true, traditional member of the Labour party after he appeared in a list of 14 MPs Jeremy Corbyn’s followers wished to complain about for their abusive behaviour. Coyle insisted that he had been ‘defamed’ because the complaint was specifically against him for accusing Corbyn of being a ‘fake’. The trouble for Coyle was, he had indeed called Corbyn a fake, and been forced to apologise for it. He also accused Corbyn and his supporters of creating a victim culture, which must surely be a case of projection. This is, after all, what New Labour has been trying to do with its constant accusations of misogyny and anti-Semitism against Jeremy Corbyn and Momentum. Now as Mike points out in his article on Smudger and Nye Bevan, the NHS is an iconic institution with immense symbolic value, so naturally Smudger wants to identify himself with its founder. The trouble is, he and Coyle are polar opposites to what Atlee and Bevan actually stood for. Both of them were classic old Labour. The 1945 Labour government had put in its manifesto that it was going to create the NHS, and nationalise the electricity, coal and gas industries, as well as the railways and other parts of the transport infrastructure. This was part of the socialist ideology that the workers’ should take into their hands the means of production, distribution and exchange. Bevan himself was a champagne socialist – he got on very well with the circles of elite businessmen in which he moved. But he despised the Tories as ‘vermin’, and his book, In Place of Fear, made it very clear that he felt alienated in Westminster because it was a palace created by the ruling classes to celebrate their power against working people. He was resolutely determined that the NHS should be universal, state-owned, and free at the point of service. It’s true that like some other politicians, he considered charging hospital patients a ‘hotel’ charge for taking up beds, but he dropped this idea. And the reason he left office was in disgust at the introduction of prescription charges. This is in exact opposition to Blair and his ideological descendants in Progress, Saving Labour and Tomorrow’s Labour. Blair vastly extended the Tories’ privatisation of the NHS, quite apart from demanding the repeal of Clause 4, which committed the party to nationalisation. He and his followers, Smudger, Coyle and the like, stand for privatisation and the dismantlement of the welfare state. While Bevan wanted to remove the fear of want and destitution from millions of the working class, Blair and co have striven with the Tories to bring it back, through measures designed to ingratiate themselves with the Tory press. Such as the introduction of the Work Capability Test, which was launched after a conference in the early 2000s with the Labour party in consultation with insurance fraudsters, Unum, and which specifically assumes most disabled people claiming benefit are malingerers. And then there was the case of Rachel Reeves declaring that New Labour would be even harder on benefit claimants than the Tories. Quite apart from approving comments from New Labour apparatchiks about the wonders of workfare. As for Coyle’s claim that he supports ‘internationalism and collectivism’, you to have to wonder when. For many on the left, who consider themselves ‘internationalists’, the term does not include imperialism and the invasion of other, poorer nations for corporate profit. But this is what Blair’s foreign policy – the invasion and occupation of Iraq consisted of, just as his successors, Cameron and May, are also imperialists. Mike states in one of his pieces that he doesn’t know how many of the 552 MPs, who voted for air strikes in Syria, were Labour; but he does know that two, who voted against it, were Corbyn and John McDonnell. As for ‘collectivism’, it should be noted that this is not the same as ‘socialism’. Blair claimed to be a collectivist in making private enterprise work for the community as part of his vaunted Third Way. Which incidentally was the claim of the Fascists. In practice, however, this meant nothing more or less than the continuation of Thatcherism. This was shown very clearly by the way Blair invited her round to No. 10 after he won the election, and the favouritism he showed to Tory defectors. So no, Owen Smith and Neil Coyle are not the spiritual heirs of Atlee and Bevan. Whereas the latter stood for the welfare state, socialism and improving conditions for the working class, Smith and Coyle have done the precise opposite, as have their followers. Mike also reported this week that in 2014 the Labour party conference voted down a motion to renationalise the NHS. This shows how far New Labour and its supporters have moved from Atlee’s and Bevan’s vision. They are Conservative entryists, who deserve to be treated as such, and removed from power before they do any more harm.